Schroon Lake, James E. Foster, 87 passed away July 21, 2018 at his home after a brief illness. Jim was born November 18, 1930 in Mt. Vernon, NY the son of the late William E. and Margaret Baker Foster. Jim was predeceased by his sister and brother-in-law William and Margarette Behrman and his stepson Kenneth (Corky) Cypher. 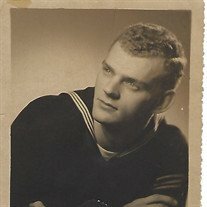 Jim was a Veteran of the Korean War having served in the U.S. Navy from 1951 until his honorable discharge in 1955. He was a member of VFW Post#362 Schroon Lake, NY. He Taught little baseball and enjoyed photography and taking long rides in the mountains..
Jim was a Design Engineer and worked for many companies over the years. He retired from Lorad in Danbury Ct.
Jim graduated from Edison High School. Lou Gehrig's mother lived up the street so perhaps there was baseball magic in the neighborhood. Jim was a star pitcher in high school and still holds many records that remain unbroken, such as his 46 strike outs in 21 innings. This dedicated young man used to walk 5 miles to and from a baseball field in order to play. He was scouted by 7 major league teams. Fulfilling a lifelong dream, upon his high school graduation he accepted an offer from the New York Yankees and signed a contract in 1945. As his baseball career was beginning to take off in 1950 the US entered the Korean War and Jim was compelled to enlist in the Navy. While in the Navy Jim played baseball in the Inter Service League. His reputation preceded him and he was much sought after as a pitcher. 2 Captains and an Admiral fought over him to pitch for their teams. He once pitched and won both ends of a double header. After Jim's tour on the Roosevelt and back in port at Norfolk, apilot who was his coach promised to personally fly Jim to NYC as a reward for a big win, Jim obliged and was flown to Floyd Bennett Field. Jim had a full and very interesting life and enjoyed his retirement years in Schroon Lake. Jim is survived by his wife of 27 years Shirley Raymunt of Schroon Lake, his 5 children, James and Mary Foster of Florida, Mark and Melissa Foster of Texas, Brian and Stephanie Foster of Florida, Bruce Foster of Colorado, Brenda and Dave Dahlstrand of Georgia, 9 grandchildren, 1 great grandchild and several nieces and nephews. Also four step children, Michael Cypher of Florida, Barbara & Carlos Barreto of Ct., Felicia and Howard Canfield of Florida, and Joy Miles of Ct. 14 step grandchildren, 9 step great grandchildren, 1great niece and many nieces and nephews. A Funeral Service will be held Thursday afternoon July 26, 2018 at 2:00 PM at the Edward L. Kelly Funeral Home 1019 US Rt. 9. Interment with Military Honors will follow at the Severance Cemetery on Stowell Road in Schroon Lake. Family and friends may call at the Edward L. Kelly Funeral Home from 12 noon until 2:00 PM.